1. Run at least three weekdays, at least 4 miles. 2. Complete my long run. 3. Complete a real crosstraining workout at the gym. 4 miles. Did 4x1 intervals run/walk. Super humid and pretty slow, but so glad I went. 4 mile progression run on treadmill. Last mile at 8:55. Definitely a morale booster. 9 miles on treadmill. 4 or 5 SportsBeans pre-run, 2 Gu Chomps at 2 miles (with water and walk break), 1 Chomp at mile 4. Felt AWESOME. Fast & Furious on TV helped, too haha. Ran in Kayanos. Definitely the right shoes for me. I missed one of my 4-milers, but it was necessary. I was going to run it on Thursday, but had to be up and on a bus by 5am to go to Orlando for an all-day event for school. We didn't get home until well after 9pm. I ended up taking three rest days in a row, which was a little much, but I didn't want to run the day before my long run. I finally got a fuelbelt that I'm super excited to begin using, but I somehow forgot to turn my alarm on. I woke up with the sun and thought blearily, "Why is is bright out?" Yeah. So I had to do my run on the treadmill. I refused to let this long run fall by the wayside. I got it done, even if it meant using the treadmill. I was scheduled for 8 miles. Matt brought my headphones at mile 4. I felt so good, I did an extra mile. I could have even done 10, but I began to have some knee and hip discomfort, and there's no reason to push myself and possibly cause injury at this point. Feeling so strong left me feeling really positive. I'm excited to tackle 12 miles next week! I'd been so worried about this run - testing fueling again and doing it on the treadmill instead of outside - that the relief of it being a success has really broken down a wall I was mentally fighting. 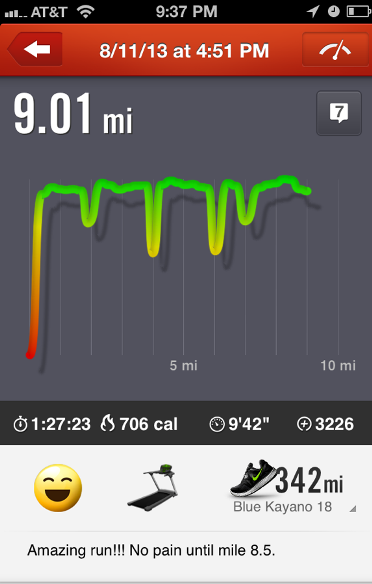 Despite keeping the treadmill at the same MPH the entire time, my pace still fluctuated. So weird. I ate 4 or 5 SportsBeans about 15 minutes before the run. (They're caffeinated.) I was going to run 4x1 intervals but felt too good, so instead I chose to take water breaks every two miles or so. At the first two-mile mark, I ate two Chomps (caffeine free) and had some water; I ate a third Chomp at mile 5. These things are EASY to eat, tasty, and WORK! Definitely my preference for fuel. 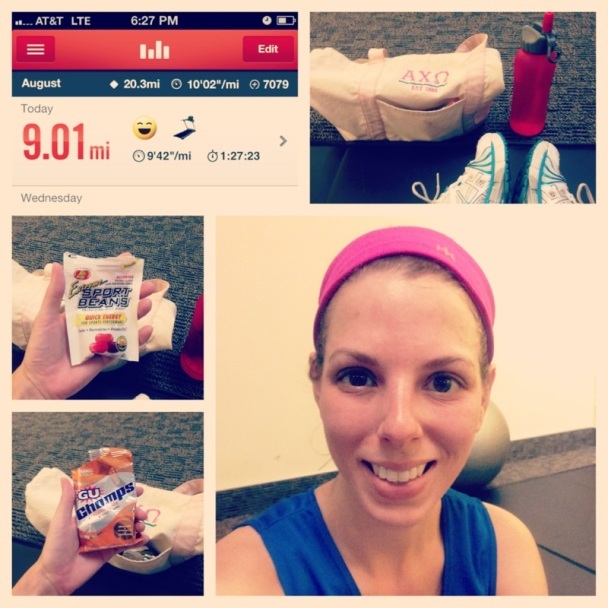 I was still feeling really strong; added an extra mile and pushed my pace. I did have some "intestinal discomfort" around mile 7. I'm just not used to eating on the run yet. But I didn't have to stop, and the feeling passed. It was really fun to watch people come and go. I got there just as rush hour began, so there were people on the treadmills on either side of me. As they came and went, I kept on trucking. And my pace was easily under 10 minute miles the entire time, even including my walk breaks. Love it. This run also solidified for me that I need to return the Brooks for my Asics. My feet just felt so perfect in my tried-and-true shoes. Now I know that Kayanos are my sole-mates for life! Did you have a long run or race this weekend? Nice workout! Don't you just love the ones where you step away thinking, yep I totally rocked that! I love running on the treadmill and feel like a total badass when people go and come on the mills next to me and I am still going strong. I am starting my half training plan this week so I have sprint work tomorrow yay! I know everyone has their own run to do and I shouldn't compare, but it IS really fun to know you're outrunning people! Sprint work is so fun! The rest pays off! And the right shoes make for a better run, right?! I need to try some fuel during my runs. I think that'll help. I feel a little like the Princess and the Pea when it comes to shoes haha! And yes, the fuel definitely helped. I could tell my energy levels were staying consistent because of it! You are amazing! Glad you had an awesome week of running. My goals are to run at least 4 miles, get out at least three times this week and begin sprint training. I am running so slowly. 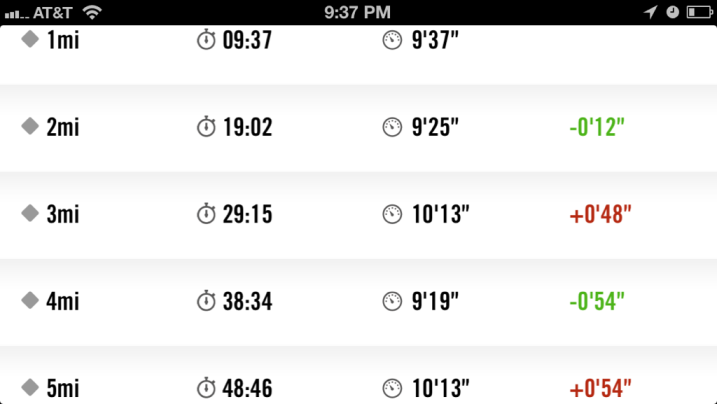 After 14 weeks of running I am going farther, but not faster. Any advice? When you were a newbie how long did it take you to start getting faster? Speed work works if you work it :o) I find running hills and doing sprints or intervals helps with pace. But also, just being consistent. My pace got way faster while I was going that run streak, even though some days I only ran 1 mile. I think the more you run, the faster you get naturally, but you need to be consistent. 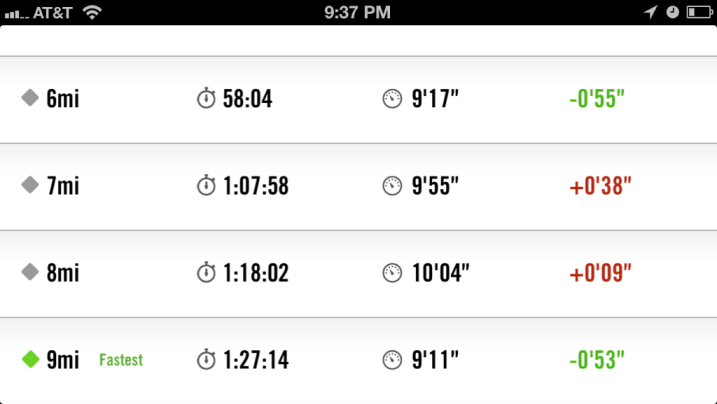 I started off most of my runs/races around a 10:20 pace and now run in the mid-9s for the majority of my runs. Not a huge decrease, but I don't really focus on speed. I think as I add bridges back into my training, I'll see an increase in my speed again. Sounds like a great week of training! I can't wait to hear what you think of the fuel belt! Thanks! I'm excited to use it tomorrow morning...I'll definitely have to write a full report. 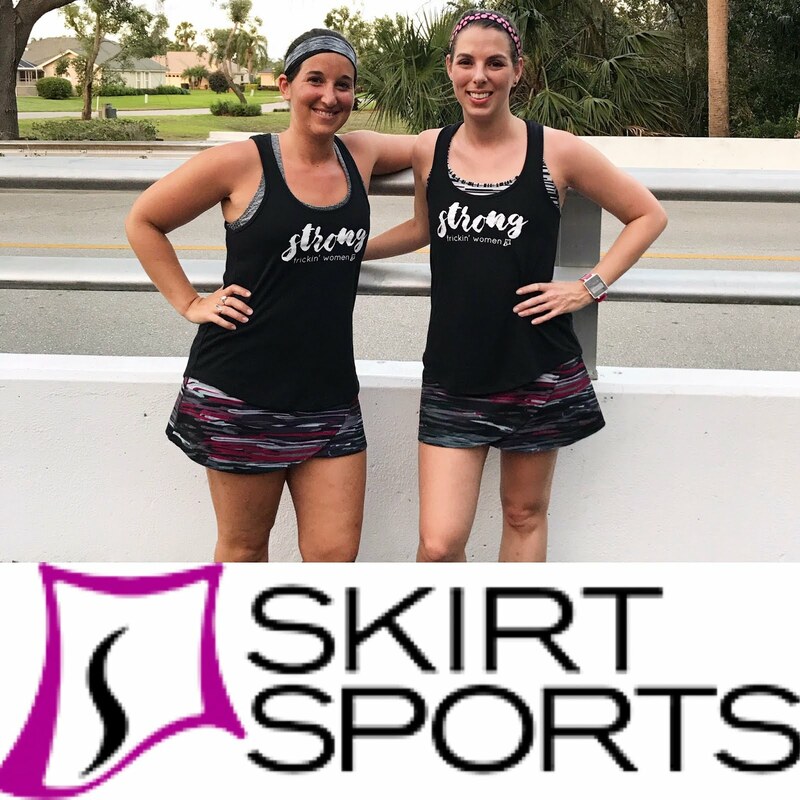 Awesome job on rockin that 9-miler!!! I really like Honeystingers in Fruit Smoothie. They are slightly smaller than Chomps and really flavorful! Which fuelbelt did you get? I think Honeystingers all have wheat in them :o( I looked at them today and was disappointed to see that! I got the Nathan Speed 4 or something like that, in basic black. I'll wear it on the run tomorrow and post on my experience with it!